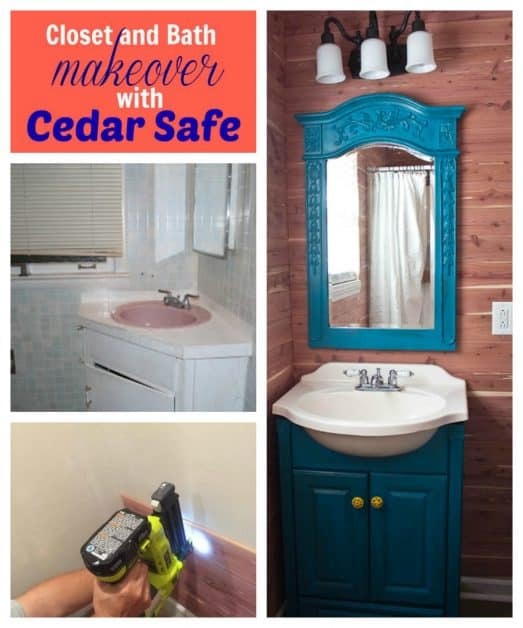 I am so happy to show you our closet and bath makeover with Cedar Safe planks. This post contains affiliate links for your convenience. You can read my full disclosure here. I will always be honest about my opinions of the products that we use. But first, I have to tell you how wonderful our lake house smells when you open the door to enter! Our lake house is a summer home and we do not live there year round. The house is decorated very rustic and when you walk in and smell the cedar, it is glorious! Everyone comments how wonderful it smells. 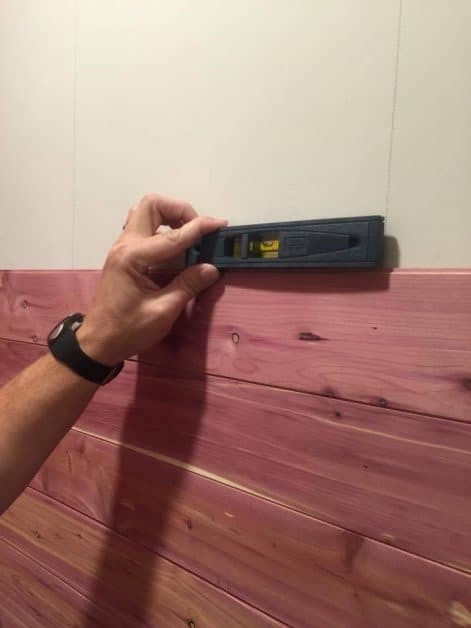 Not only does the Cedar Safe planks smell good, the cedar helps with the mold and the mildew that comes with owning a lake house. 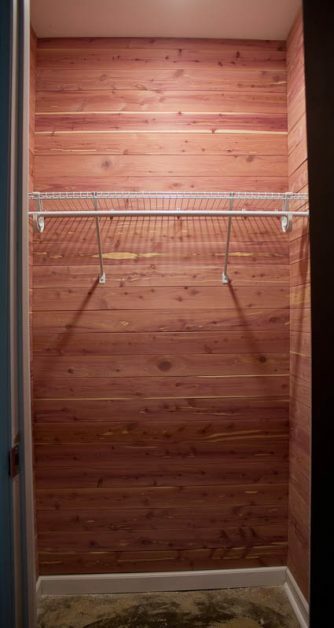 Aromatic Cedar not only looks and smells luxurious, but CedarSafe 100% Aromatic Cedar natural Closet Liners are easy to install and all natural. The cedar helps with moths and bugs which is a plus when your house can sit for weeks without anyone in it. My husband and I purchased an older home at the lake that had to be totally renovated. We did almost all the work so that we stayed under budget and because in some cases, we could not get any workers to show up. 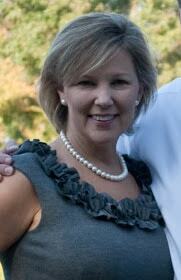 We were inexperienced and we learned as we took on each project. You can view our entire lake house remodel here. 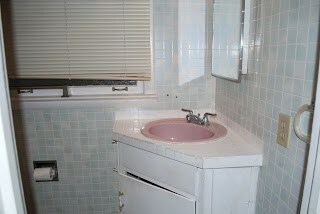 Picture of the bath after the remodel but we were not happy yet. We have always wanted a cedar closet, and this past summer while I was at a DIY conference, I talked with a representative from Cedar Safe. I shared the story of our remodel with the representative and she graciously sent us the cedar to do a closet and also the small master bath. 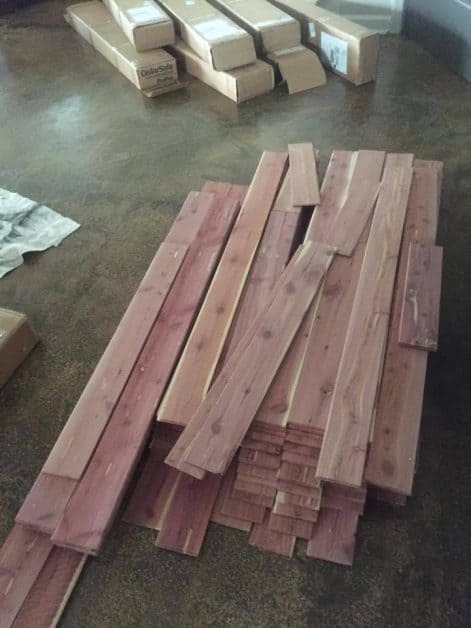 I received the cedar promptly. The first thing you have to do is remove the cedar from the boxes and let the planks acclimate to the house for 48 hours. 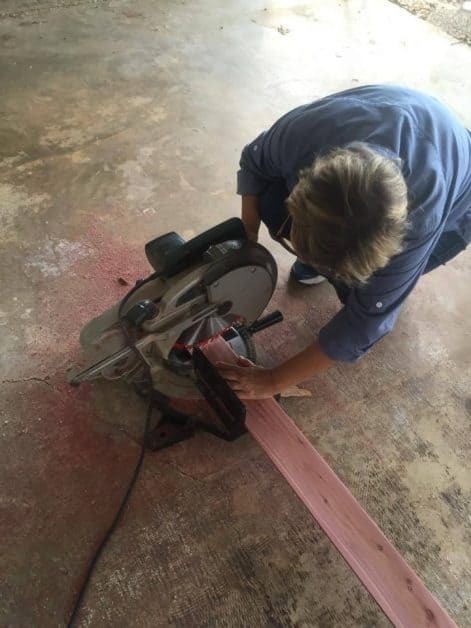 Make sure you lay the planks flat so that they will not bend. It took us two weekends to do both rooms, and we worked a couple of hours each day. The work is not hard at all, and when we got a routine going with him measuring and me cutting the planks, it went smoothly. We drew two lines on the wall with a pencil to show where the studs were located. We made sure that each plank was level by using a leveler on every board. 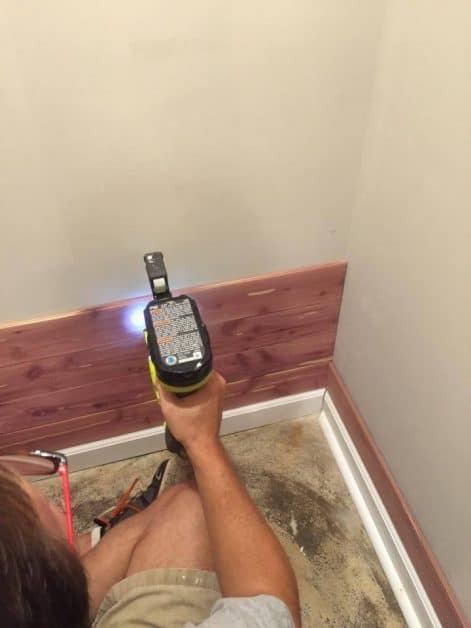 Make sure the first board is level! If the top board was not level when we sat it on top of the previous board, we would cheat it up a tiny bit so that it would be level. As you can see, it is not noticeable. 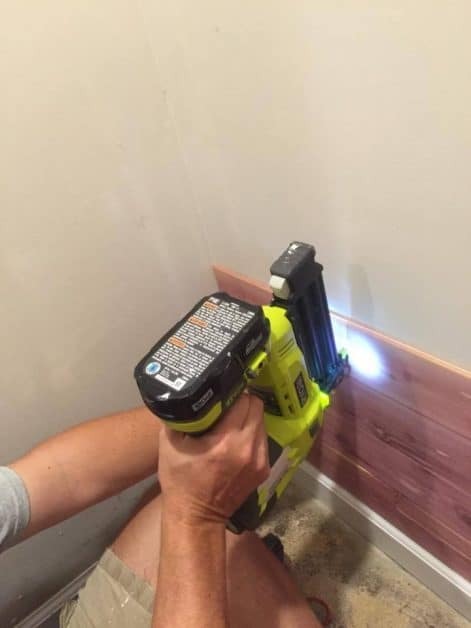 We used this Ryobi nail gun and it made the job much easier. I highly recommend this nail gun. The second weekend we worked, we did the master bath. 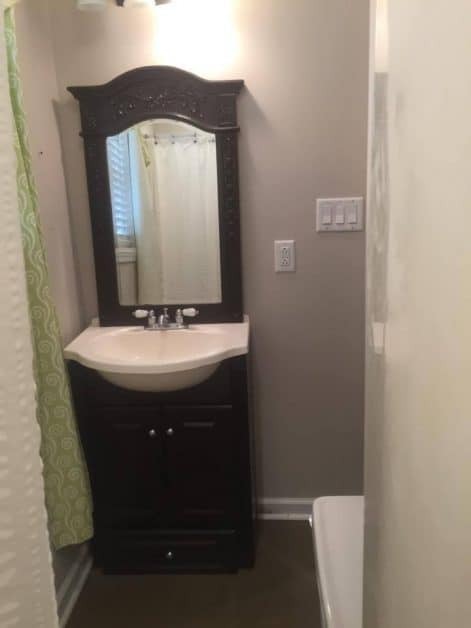 We removed the vanity but we did not have to remove the toilet. 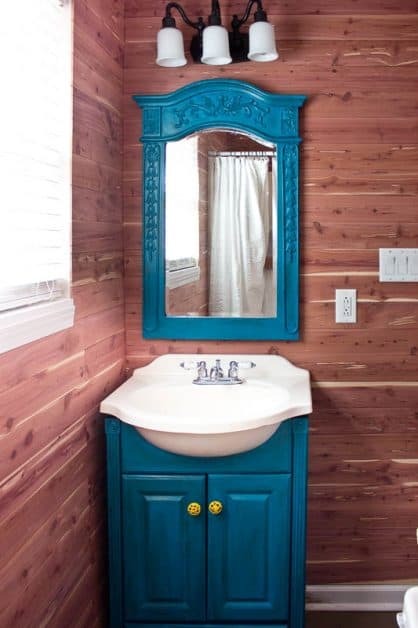 After we installed the planks, I repainted the bathroom cabinet and mirror and the transformation is fabulous! I will not be adding the curtains back in the room because I do not want to cover up the beautiful walls. I could not wait for my son and daughter to see the new rooms completed. They both walked in and had a shocked smile on their faces, priceless! My family LOVES how beautiful this closet and bath makeover is with Cedar Safe and we believe that it adds so much value to our home. Wow! It looks beautiful! I love the smell of cedar, too! Holy Cow Sherry…the transformation is fantastic and I can only imagine how wonderful it smells as well It is the perfect wall treatment for any home, but especially your lake house. 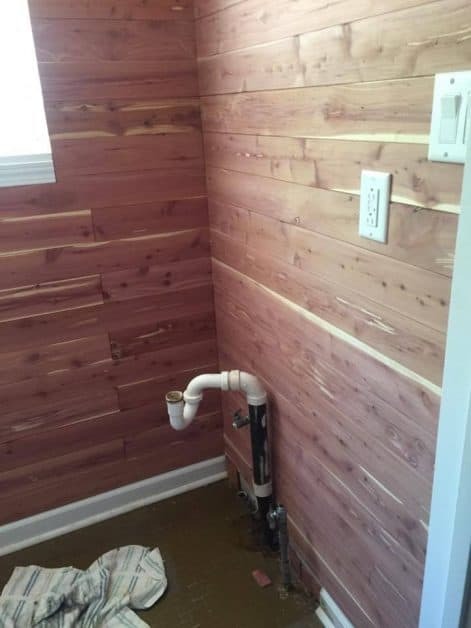 What a logical use for the cedar planks. Well done my friend, And now, the only thing that lake house needs is a girl’s weekend! hint hint! What a fantastic makeover! You are very handy indeed! Wow!! This is a stunner!! And I bet it smells soooooo goood!! Aweomse makeover, my friend! When I was little we used to visit my aunt in Louisiana and she had a cedar closet. To this day the smell of cedar reminds me of her. This is a beautiful transformation. 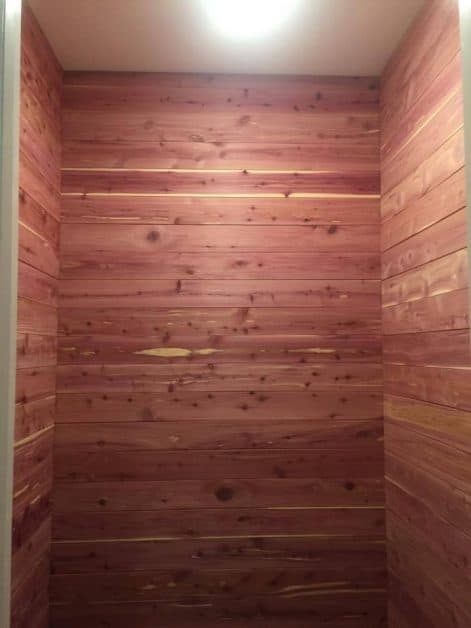 The Cedar looks great in the bath and closet and I bet it smells wonderful! What a fantastic transformation!